Most people are under the impression that setting up a website is the only thing involved in running an e-commerce store. This couldn’t be any further from the truth. If you want to be a part of the international e-commerce market that is growing at a 20% CAGR (combined annual growth rate) and is set to reach $4 trillion by 2020, you’ll need a lot more than just a website. SEO is perhaps the best means of attracting a regular flow of organic traffic to your online store. Not only is organic traffic virtually free, if done properly, it is likely to provide you with better conversion rates. However, owing to the complex structure of e-commerce sites, implementing SEO is often difficult. As a result, most e-commerce sites tend to underperform in organic searches. 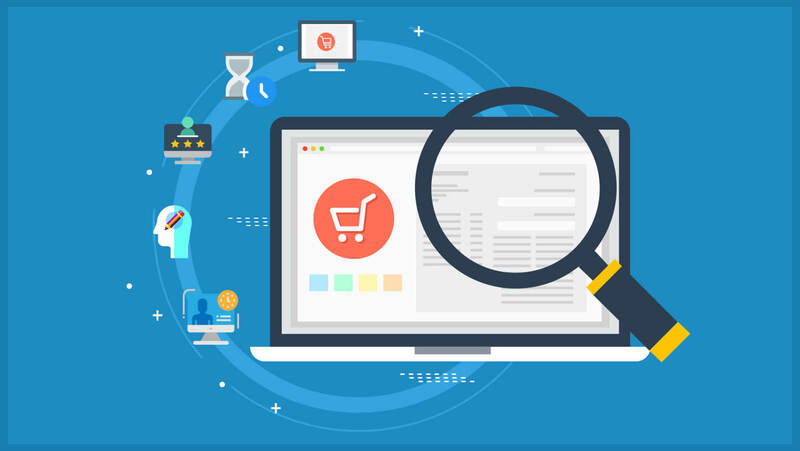 Online store owners, digital marketers, web designers, and developers all need to have a thorough understanding of the most common e-commerce SEO challenges. Let’s take a look at these problems and discuss some ways to overcome them. Usually, e-commerce sites sell hundreds of products. Thus, most site owners focus on creating short and automated descriptions for them. They also remain focused on details particular to a product such as features and specifications. 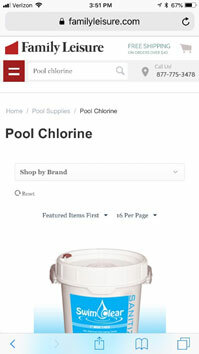 Brief product descriptions mean search engines have little or no content to crawl. Automation, on the other hand, leads to redundancy, which in turn, may lead to duplicate content issues. In short, you need to improve the SEO quality of the content throughout your product pages. The sole purpose of writing a compelling product description is to attract your target audience. So, the first thing to do is to write with your target customers in mind, i.e. make sure to use natural language when writing the description instead of using jargon. You need to study buyer personas carefully to find out the kind of language they use to search for specific products. Think of how you will sell the product if they were buying from a salesperson directly. Explore social media and sites such as Quora to find out the questions people ask and the language they use when talking about your products or industry. Everlane uses this strategy to create attention-grabbing product descriptions. They use every day phrases such as “All Damn Day” in the description. As you need to use natural language, using long-tail keywords in the product description can serve a number of purposes. Long-tail keywords have a higher conversion value, as they are more specific. The longer the search query, the higher is the intent of purchase. However, use the focus keyword sensibly. You can use it once in the title and the page URL each, and no more than twice in the description body, especially if it’s a shorter description. Also, and this should go without saying, make sure it looks and sounds natural. Don’t be afraid to include humor in the descriptions, if you can. Including emotions in your product description can increase its natural appeal. However, when doing so, make sure to point out the essential features and benefits. Be honest and specific about everything. The last thing you want is your customers receiving products that lack the features you mentioned. Website loading speed is one of the most common SEO concerns for e-commerce site owners. 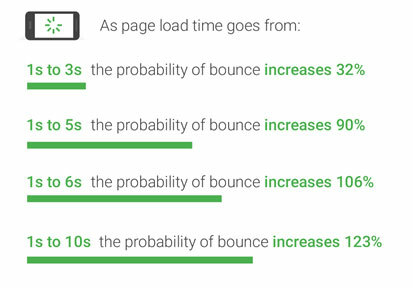 Slower loading sites often experience higher bounce rates, and therefore, lower conversions. According to Google, as page load time goes from one second to ten seconds, the probability of a mobile site visitor bouncing increases by 123%. The bottom line is, you need a website that loads quickly on all devices. You can’t create an e-commerce website without a substantial number of high-quality pictures and videos. However, without optimization, these media elements can slow down your website considerably. Scale each image according to the design parameters. For example, avoid using a 5000 X 5000-pixel image if you are going to display it at 500 X 500; it will slow down your site. As a general rule, always use JPG image format, as it can be compressed to save space and loading time. You can use PNG images for transparency, but avoid using TIFF and BMP formats altogether. Make sure to compress all photos and videos before uploading them. Alternatively, you can use a third-party video platform such as YouTube or Vimeo to host your videos, as it will take the burden off your server. When you enable browser caching, your website can temporarily store some data on a visitors’ computer. There is no need to send all the HTTP requests to the central server. So, the next time people visit your site, it can load faster. The amount of time you can store cache data will, however, depend on their browser configuration and your server-side cache settings. You can also use a Content Delivery Network (CDN) to speed up your site. A CDN is a network of servers that deliver web pages and other content from the nearest server to the user. The reduced distance results in faster loading speeds. It can also reduce the amount of data using minification and file compression, leading to quicker loading times. You also need to optimize the CSS, as it loads before your site becomes visible on the screen. Examine your CSS coding thoroughly and get rid of excess wherever possible. Also, minimize your CSS files as it will remove extra spaces from your code. Your CSS code will have a minimization option. If it doesn’t, you can use a variety of free online CSS minification tools. People often read customer reviews before making an online purchase. According to BrightLocal, 85% of consumers trust online reviews as much as personal recommendations, and positive reviews make 73% of consumers trust a local business more. Going beyond consumers, Google also uses customer reviews as a criterion for search engine ranking. All user reviews require a response, especially the negative ones. Respond to negative reviews as quickly as possible to mitigate potential damage to your reputation. A quick response shows that you are listening and that you care. It also allows your prospects to make an informed purchase decision. Most people factor not just online reviews, but also the site owner’s response into their buying process. Product listings with a higher number of reviews and appropriate responses tend to bring in more web traffic. In fact, Google even confirmed that responding to reviews can help your local search presence. Negative reviews can be just as beneficial in contributing to consumer trust. They are proof that your site gets 100% authentic reviews and you have nothing to hide. You will need to use a product rating and review platform on your site to manage customer feedback in real time. Google gathers user rating data only from verified Google Review Partners. So, make sure the platform is a licensed Google partner. Keep in mind, not all platforms are available in all countries. If you are tapping into the global market or doing business in more than one nation, choose the appropriate platform. Lastly, consider other features like compatibility with search engines other than Google or integration with social media management platforms. Your prospects should be able to find what they want quickly. That’s why you need to create the product category structure and overall website navigation with the user in mind. An optimized category structure can also provide your website with higher search rankings. Shallow site structure is beneficial for both consumers and search engine bots. Shallow site structure demands that you shouldn’t stuff too many items in the main category, preferably no more than 10. You can add a sufficient number of secondary drop-down or pull-out menus. However, subcategories should relate to the main category logically. Your focus should be on building user-friendly navigation, rather than creating categories for search phrases. Make sure they are visually and clearly presented on the site. Keep them organized the way your users would expect. You are probably selling products varying in size, color, material, and price. So, you will need to create precise product segments based on these parameters to guide visitors down the sale funnel. For example, when you go to the New Arrivals subsection of the Girls category (see below image), you can filter the products by category, size, color, and price. This may seem obvious, but you should also include a sharp search function in the top right corner of your site. Some consumers will prefer searching for their products by typing brand names or generic terms. They will certainly appreciate an agile search function, which in turn, will improve the user experience and search engine rankings. Keep the search box visible, even in the mobile-friendly version of your site. 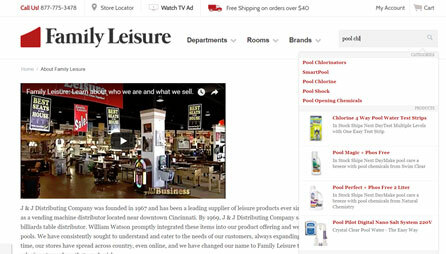 Family Leisure, an online outlet that sells home relaxation equipment, does a fantastic job of making their search bar the first thing a visitor sees when they arrive on the mobile site. Always be sure the search box is amply visible, making it easier to find the desired product, whether the user is on a desktop or a mobile device. Additionally, be sure to add a smart autocomplete function with error-correction to help customers find what they need. You can also tap into Advanced Data Analytics and Artificial Intelligence to build a better on-site search function. These technologies can identify a user’s intent and guide them down the sales funnel accordingly. Lastly, as the search engines can change by the day, you will need to consistently monitor and adjust various SEO-related aspects of your site. An e-commerce site needs to add or remove products, subcategories, sales and discount pages from time to time. You have to make sure none of these changes affect your SEO parameters. Google will consistently check on your website to see how it’s doing in the search results. You can use the Google Webmaster Tool or Search Console to access various tools that will help you monitor the different SEO aspects of your site. For example, you can use the PageSpeed Insights tool to measure the speed of your desktop and mobile sites. The Fetch as Google tool, on the other hand, allows you to examine how Google crawls any URL on your site. It can provide you with critical information regarding your URLs. Of course, other SEO monitoring tools can be used too. But, Google Search console is a lot easier to understand and offers many services for free. Over time, your prospects may start using different keywords to search for the same product. So, you will need to monitor the changes occurring in the keyword usage to maintain your search ranking. Once again, Google Search Console can come to your rescue. You can use the Google Keyword Planner to keep track of certain keywords to target on product pages and web content. Despite the best precautions, websites often fall prey to on-site errors such as broken links and duplicate content. You can quickly repair the “404 this page does not exist” error using Google Analytics. You will also need to use robots.txt to block duplicate-content-prone areas such as archives, tags, and sometimes even product category pages. 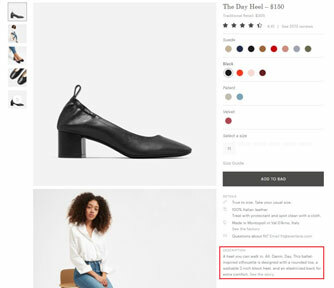 Sometimes, adding user reviews and comments may create duplicate page content where one page has product description and user reviews, while the other contains only the description. In such cases, you can use the canonical tags to instruct search engines to index the desired page. Monitoring your existing backlinks is as crucial as getting new ones to your e-commerce site. You have probably built backlinks through on-site blogging, guest blogging, and strategic partnerships with influencers and industry experts. Keep track of all these activities constantly. Make sure to remove backlinks that are no longer working and update them with new ones. You can use Google Search Console or any other paid tools for this purpose. Running a successful e-commerce site requires a lot of hard work and planning. SEO is the backbone of this long-term strategy. However, the complex nature of e-commerce sites combined with the lack of technical knowledge often leads to disastrous SEO mistakes. Hopefully, understanding the five most common e-commerce SEO challenges listed above and the ways to overcome them will push you in the right direction. Try these tips and let us know if they were helpful in the comments section below.